Have you ever observed or seen something which surprised you with its beauty, and seemed a true sign of genius to you? “Ah! a real masterpiece. Excellent!,” you might have uttered involuntarily, and then marked it as something special. Some things are such. They instantly catch our attention and make us adore them. Also, we can’t resist their loveliness and feel an instant yearning to pass a compliment about them. Those things are what we call the masterpieces. Whether it be your favorite song, book, or movie – you prefer to see it as a masterpiece because you love it, and so do others. All people have their own choices which they think of as masterpieces, which really are masterpieces, in their own ways. 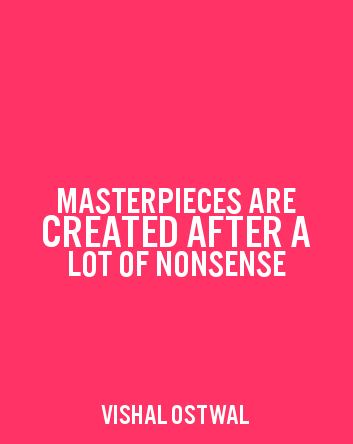 However, your favorite artists or people don’t always create masterpieces. Sometimes they create all nonsense, and you know it too. They can’t always be great, neither can anyone else be. But can’t one always be great? Why can’t one always create masterpieces? No, it cannot be that way, and neither will it ever be. There’s a truth behind it. Each time someone creates something, he wants it to be a masterpiece. Don’t you feel the same way? Everyone is always ready to give in a little extra effort to his work, and then he almost does it every time. We can always create a masterpiece from our side, but it isn’t the same thing for everyone. There are several choices, several opinions, several demands and several people who judge what we create. Some masterpieces are created because their base are good ideas which are born from thoughts, many thoughts. Then how are masterpieces created? So, as you see, masterpieces aren’t always made with a lot of planning and doing the task perfectly. Instead, they’re made because of something else. A very common thing. And that thing is – work. That’s it. Work. A lot of it. No one can ever imagine a perfect thing of his choice and just bring it in existence with his desire of creating it. One can always try to do it perfect, but in the end there are many things that matter, which cannot make a thing universally perfect. But when we do a lot of work, we create a lot of things too. We learn something new each time, and use those lessons and ideas for our further progress. Slowly we move, slowly we try, slowly we learn and then we end up creating masterpieces. We can always try to create masterpieces. But what matters more than it is trying. Doing a lot of work surely increases our probability of creating rubbish junk. And making that junk is a success. Because, out of that masterpieces are created junk. The masterpieces which shine in the eyes of the world are actually the ones which are brought into existence after a lot of nonsense that was created before it. A painter tries his best to paint a masterpiece. But in the process, he has to learn. He learns by experimenting with colors, trying new ideas, spoiling the canvas, starting over again, changing the shades and going on in spite of all failures. What if he’d sit in front of the canvas with his brush and a color palette in his hands, staring at it, and rubbing his brush keenly on the canvas? Will it help him create masterpieces? Not at all. He’ll have to learn the proper way of doing it, which he can learn only by painting a lot. The same is applicable in all professions, arts and work. The more you do it, the better you learn it, and the better you do it. You may say that old proverb, practice makes a man perfect. The more a person creates, the more chances he’ll have to show up his creativity, irrespective of how much messy it is. Because in that junk, he’ll surely have created a masterpiece. Masterpieces aren’t created because of keen effort or perfection, but due to a lot of work and after a lot of nonsense. Focus on creating and keeping up your good work, as it will surely work and help you become better. That’s how you create masterpieces.